When walking alone in an unfamiliar neighborhood, you may find yourself feeling uncomfortable and unsafe even though you are following the turn by turn directions of Google Maps. This is a direct result of the oversight and assumption that the shortest path is the best path to follow. Furthermore, once you are in an unsafe scenario, without prior preparation there is not much that can be done to help. 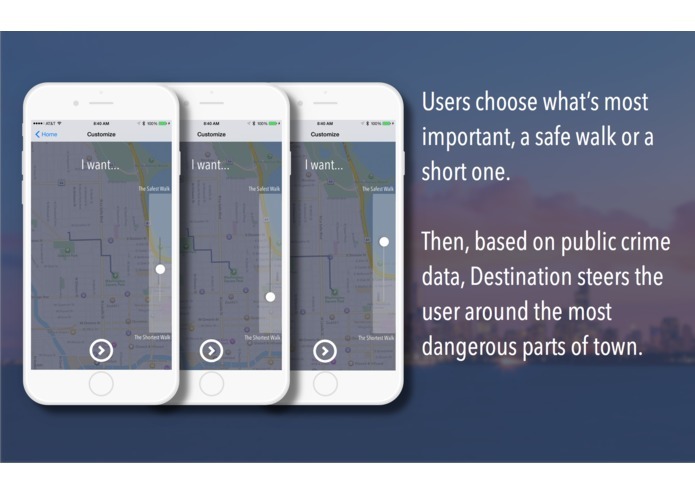 We aim to solve this problem with the development of Destination, an iPhone application that provides users with the safest routes to their desired locations. We determine the safety of a route by aggregating publicly available crime information and determining the relative risk of following a specific path. 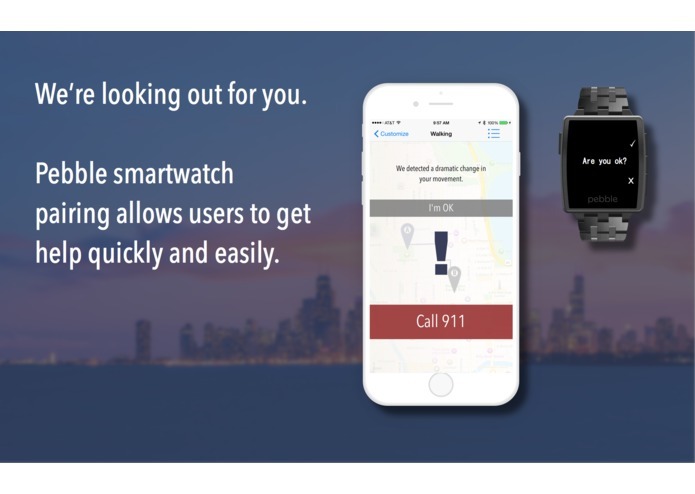 Destination also tracks the users' movement patterns and if it detects any suspicious activity, such as a quick increase in speed or inactivity for extended periods of time, it gives you a popup Pebble smartwatch asking if you are okay. 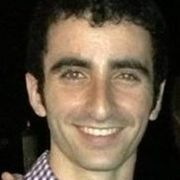 If there is no response or if you respond no, using the Twilio API we are able to immediately and automatically phone for help. Before we can deal with determining possible paths, we had to collect and understand the crime information. We used Chicago as our case study, since the government publicly releases all crime information. Given some number of crime incidents we calculate the Kernel Density Estimation, which allows us to interpolate the risk of crime and generate a heat map of where crimes are likely to occur. We overlay this information on the user's map to allow them to make educated decisions about their routes. Looking at popular destination routing software, we saw that no API would give us the ability to route around specific edges. Since we felt this ability was necessary, we downloaded the entire map information and store it as a graph, manually implementing our own pathfinding algorithms. We store all of our crime information, nodes, and edges all in MongoDB. We use a modification of the bidirectional Dijkstra pathfinding algorithm to determine the shortest and the safest paths. We then recursively compute other paths in between that provide a trade off between safety and distance. We then allow the user to choose, using a slider, what path they would be most comfortable following at a glance. Once the user selects the path they would like to follow they are presented with turn by turn directions that guide them to their destination. Currently, we have plans to extend Destination by taking into account more comprehensive measures of risk as well as trying to find characteristic features of specific regions that are connected with high risk areas and using this to find safe paths in cities that do not make their crime data publicly accessible. 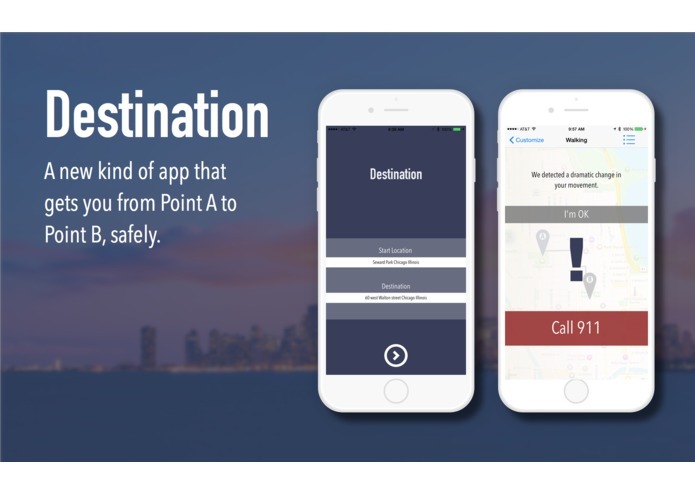 Overall, by providing a much needed service to people walking alone in an intuitive and elegant iPhone application, we believe that Destination can make an actual difference in reducing harm and making people feel more comfortable traveling alone in the city.